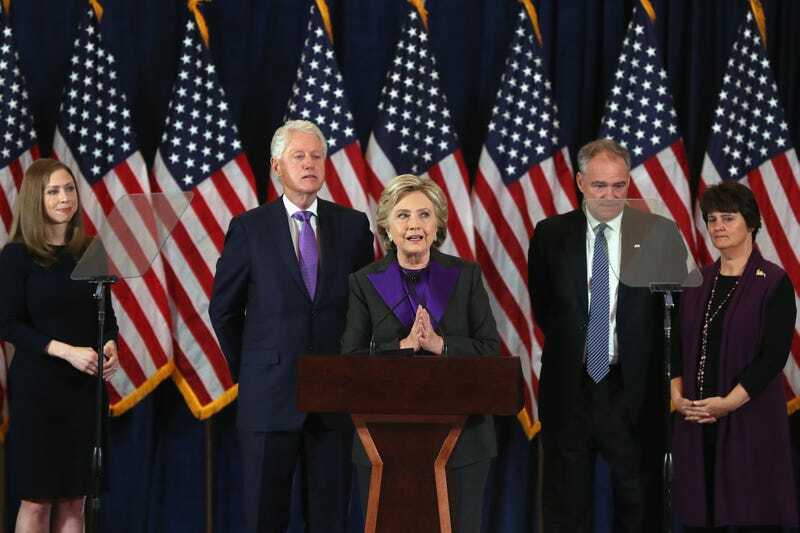 Hillary Clinton spoke Wednesday morning from the ballroom of the New Yorker Hotel in midtown Manhattan, where she calmly, graciously conceded to Donald Trump and urged her supporters to keep fighting for Democratic values. Clinton appeared before a crowd of staff and supporters, many of them looking stricken or openly crying. It was one of the saddest moments in American public life in a long, long time. “Nobody had to wonder about Hillary Clinton, whether she would accept an outcome of an election in our beautiful democracy,” Kaine added, in a jab at Trump. Clinton appeared with husband Bill at her side, along with their daughter Chelsea and Chelsea’s husband Marc Mezvinsky. She was smiling and absolutely composed, even as Bill occasionally looked near tears behind her. Clinton expressed a hope that a woman will shatter the glass ceiling someday soon, “perhaps sooner than it feels right now.” She closed by quoting the Bible (“And let us not grow weary of doing good, for in due season we will reap, if we do not give up”), and hugged her family for a long time before leaving the stage and wading into the crowd to accept hugs and handshakes, and, it appeared, to comfort a few people. You can watch her speech in full here.